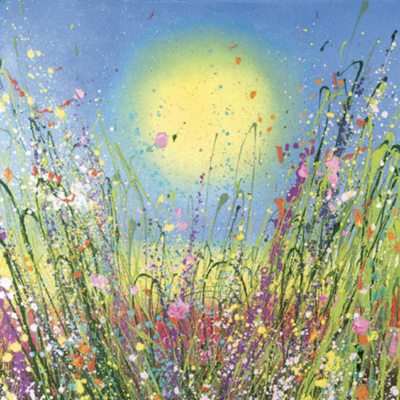 Yvonne Coomber | The Frame Gallery. For framing, art, sculpture & gifts. Yvonne was brought up on a farm and spent much of her childhood in Ireland, her mother’s homeland. Inspired by the world and with a thirst for exploration and discovery she traveled widely in her twenties, living and working in Australia, Africa and Europe. One of her most formative and fulfilling periods was spent with a horse-drawn community in England, discovering ancient, sacred and forgotten parts of our land. 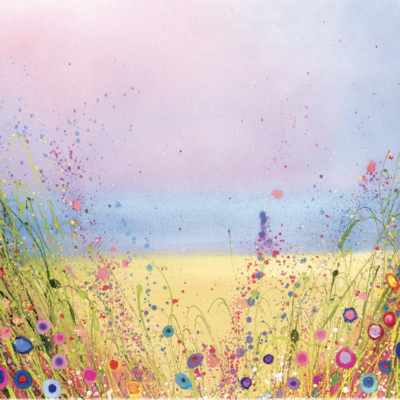 Her rainbow drenched paintings sing of wild tumbling hedgerows, tangled meadowlands, open moorlands and magical forests. They whisper of love. Her aim is to transport the viewer to an effervescent place of happiness that is literally saturated in joy. A place where paint smiles. The materials she uses are extremely important. 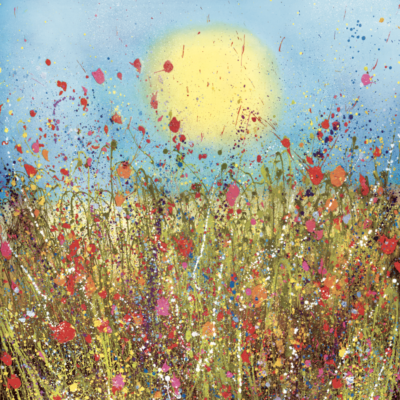 A mixture of oils, inks, glosses, glazes, fine glitter and gold leaf are applied in a multitude of layers. Washes are built up to form a work that is infused with colour. 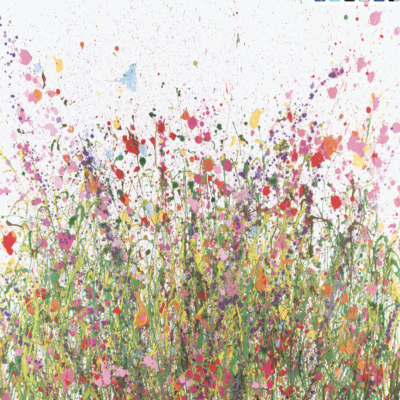 Paintbrushes, sponges, rags, palette knives and fingers are all used to create the finished piece. The result is a kaleidoscopic jewel-like composition of rich pigments that prismatically opens up to reveal the radiance and beauty of nature. Yvonne always works outside, so lacy ice and howling gales have as much influence on the final painting as scorching sunshine and gentle breezes. The weather dictates how and where the paint falls in a very direct way. The creation of the piece is a physically demanding process that requires intense concentration. The initial marks evolve from an energetic dance around the canvas and the process is full of raw emotion and passion. In the early stages of an image she throws, rubs, dribbles and pours rich stains onto linen responding to internal and external landscapes as they unfold themselves. However, in the final piece there is also a quiet calm and peacefulness present in each image. A place to rest, a place for dreams to unfold. Although Yvonne is passionate about creating beauty, her intention is ultimately to stir the viewer’s soul. Spontaneous and instinctively her paintings demand risk, courage and a weaving of magic out of what emerges. Surrendering to the canvas she touches the place where mystery lies.